I couldn’t go to sleep last night as hard as I tried…I was still awake at 3:00. We had set the alarm for 6:30, but forgot to turn it on. We got the wake- up call at 7:00. We had to rush to get ready, eat breakfast and get on the bus by 8:30. 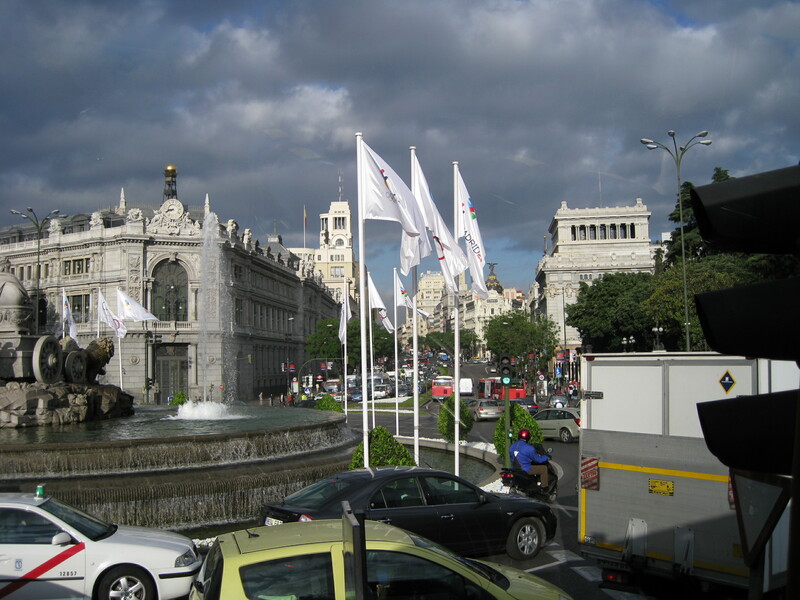 We had a very good city guide who took us all over Madrid but didn’t make any stops. People who hadn’t gotten to Madrid early did not get a chance to walk around the Puerto del Sol or Plaza Mayor. 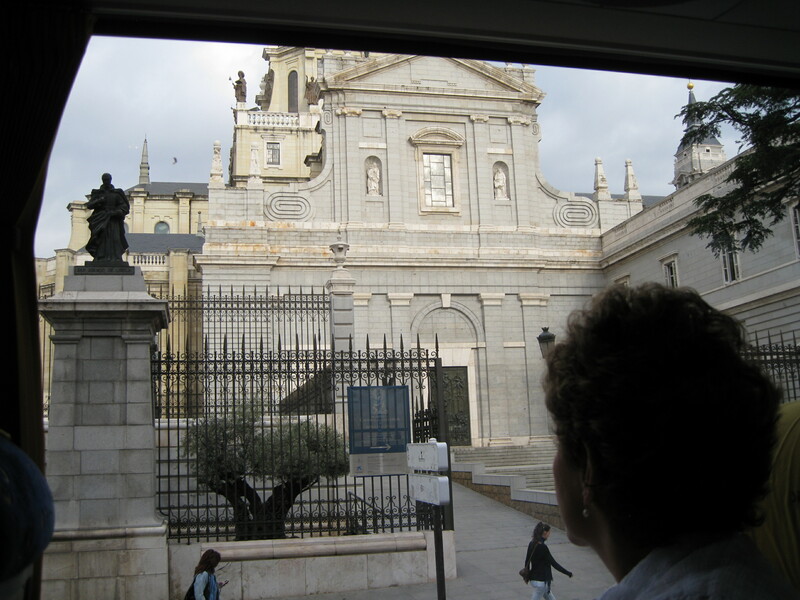 I was hoping that we would have stopped at the Almudena Cathedral which was on my list of cathedrals to do, but we just zoomed by! I did get a picture of the front from a moving bus. We stopped at the Prado Art Museum for about two hours. Our Prado guide was very knowledgeable about the paintings. 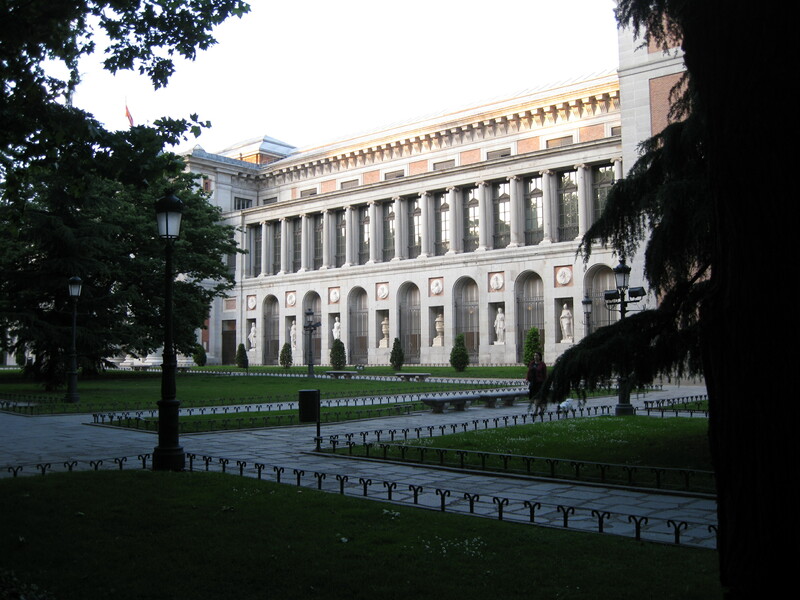 We saw painting by the Spanish masters – Velazquez, Goya, El Greco and Murillo. We also enjoyed works by Italian Masters- Raphael, Botticelli, Fra Angelico and Correggio. 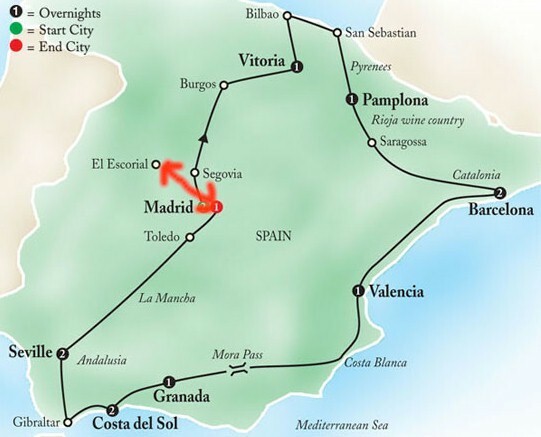 We got back on the bus for an optional tour of Escorial and the Valley of the Fallen. The bus dropped us off at the bus station where we had lunch on our own. My wife had lasagna and I had fish and French fries. It was a beautiful day with blue skies and white fluffy clouds but cool enough that our jackets felt good. We had about two hours at the Escorial. Our guide gave an excellent tour. 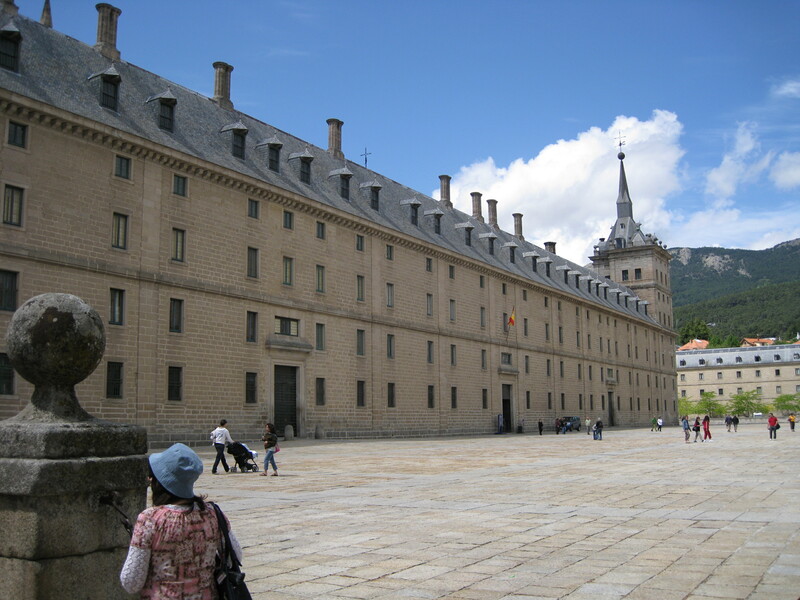 The Escorial is a huge granite fortress which houses a wealth of paintings and tapestries and also serves as a burial place for Spanish kings. There is little detail on the outside…a rather plain building. 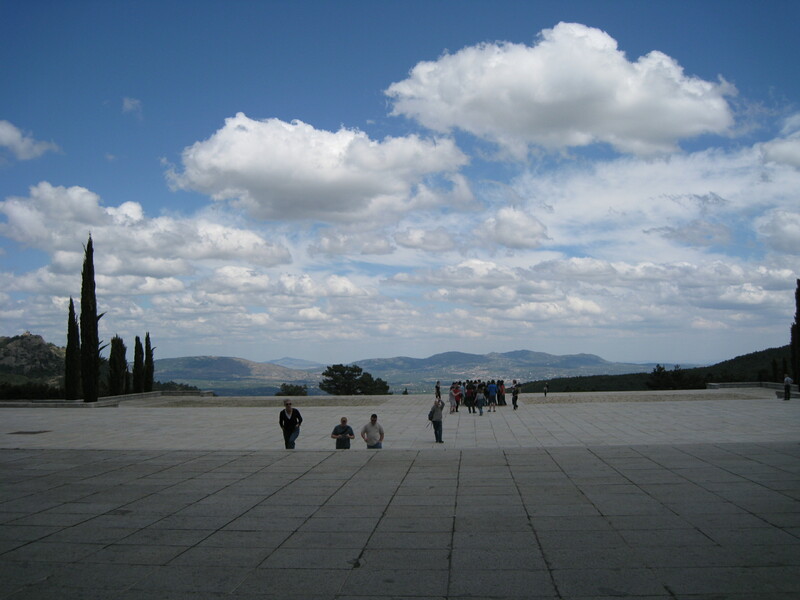 El Escorial took 21 years to complete. After his death, the original architect, Juan Bautista de Toledo, was replaced by Juan de Herrera, the greatest architect of Renaissance Spain, who completed the structure. The main entrance leads into a courtyard. The main façade has statues of the six great kings of Judea. We visited Philip II Apartments which are very monastic.Philip called them the "cell for my humble self" in this "palace for God." Philip became a religious fanatic and requested that his bedroom be erected overlooking the altar of the 295-ft.basilica, which has four organs and whose dome is based on Michelangelo's drawings for St. Peter's. They were doing some restoration work and we couldn’t go in. There was a heavy curtain over on opening and my wife started to look behind it and one of guards stopped her immediately. The Throne Room was simple. On the walls are many ancient maps. The Apartments of the Bourbon Kings are lavishly decorated, in contrast to Philip's preference for the ascetic. My wife decided that I should make door facings like in the apartments. We certainly enjoyed seeing his palace. We got back on the bus and drove to the Valley of the Fallen. 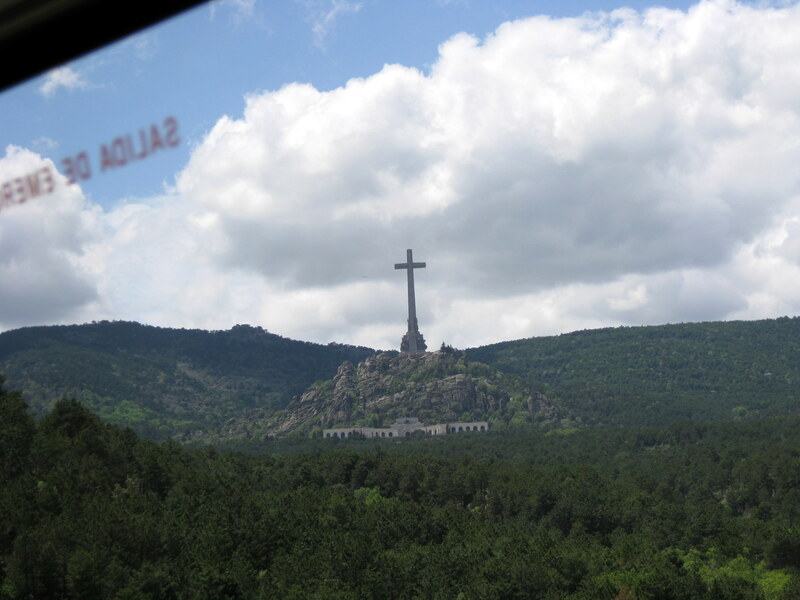 We had seen the 492 foot cross on our way to El Escorial . 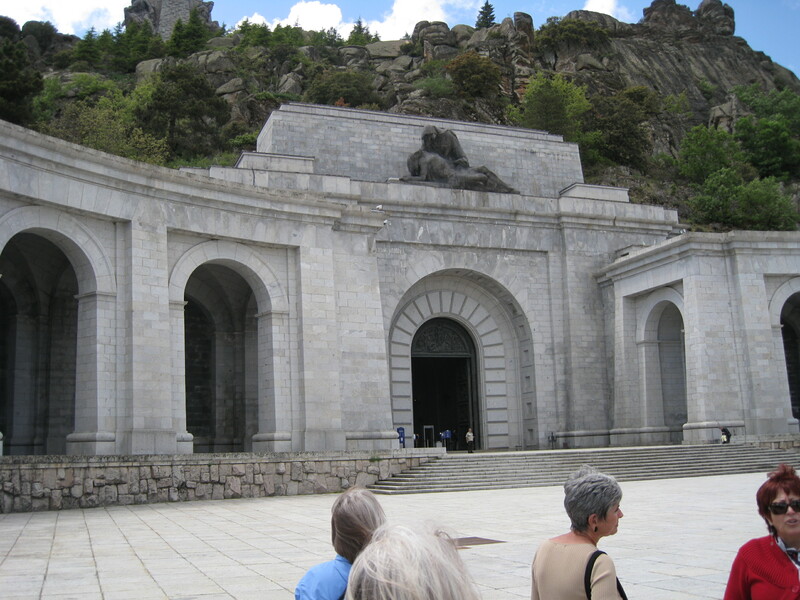 We entered a gate that had a security guard and drove for a long time before we reached the cross and the basilica.The Valley of the Fallen is Franco’s El Escorial, an architectural marvel that took 2 decades to complete, dedicated to those who died in the Spanish Civil War. Its detractors say that it represents the worst of neofascist design; its admirers say they have found renewed inspiration by coming here. There are over 38,000 victims of the Civil War buried. t in mosaic, completed in 1959. Here José Antonio Primo de Rivera, the founder of the Falange party, is buried. When this Nationalist hero was buried at El Escorial, many, especially influential monarchists, protested that he was not a royal. Infuriated, Franco decided to erect another monument. Originally it was to honor the dead on the Nationalist side only, but the intervention of several parties led to a decision to include all the fallen. We learned that Franco had civil war participants disinterred, without regard to family wishes, so they could be buried here. It was an erie place. The church itself was carved out of the mountain. It has a very long aisle with side chapels and a lot of paintings. In time Franco was buried there as well; his body was interred behind the high altar. Again, we could not take any pictures. It was beautif ul outside and we could see for a great distance. We want to learn more about the Spanish Civil war and Franco who died in 1975. I had just read a novel/fiction called “Winter in Madrid” by C.J. Sansom. It took place in Madrid after the Civil War but had flashback to the Civil War and Franco. 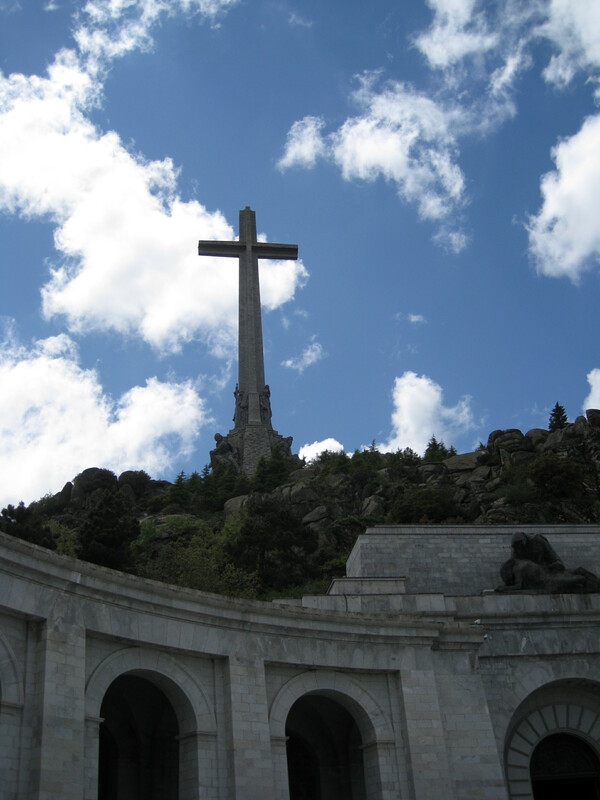 A funicular extends from near the entrance to the basilica to the base of the gigantic cross erected on the mountaintop above but it was being repaired. On the other side of the mountain is a Benedictine monastery that has sometimes been dubbed "the Hilton of monasteries" because of its seeming luxury. We got back to the hotel about 5:00. We slept a little on the bus and decided not to take a nap. Dinner was on our own. We walked up the street to see what was up there. Kaye had recommended an Italian restaurant, but it didn’t look too good. We stopped at a sidewalk café for a drink. We walked back down past the hotel toward the Prado. We found a nice outdoor café, La Taperia, across from the Prado. We had wine and tapas – a pork fillet with potatoes and carrots, raviolis tricolor and Tore de Veduras. It is frustrating to figure out how to “do dinner”. We don’t want to eat at 10:00 pm. My wife had planned on going to the Ritz to have drinks and eat tapas but we were told that there was tight security because there was a big meeting about hosting the 2016 Olympics so we didn’t try. Tomorrow we have to get up at 6:00 so we have to set our clock. It will be the first day on the bus with Kaye, our Tour Director.